Lately I’ve ignored my blog. Not because I did not want to write on it, but because I am working on a self imposed deadline and I have had to dedicate all of my writing time to my novel. It’s the great tug of war between project and platform and I’ve lost. But I’m okay with that. The joy of my novel has returned after being sucked dry by the upheaval and enhancement of various plot details. Now, I’m flying through while examining each comma, period, adjective, and sentence. 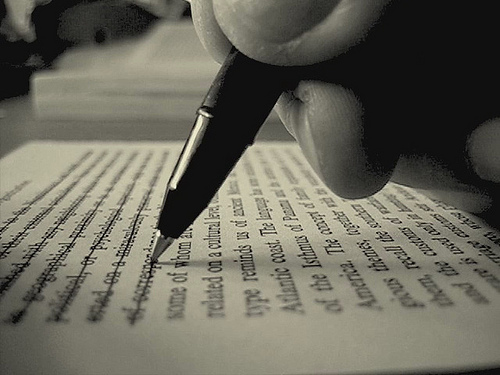 I’ve become a better writer and am editing faster and faster as I encounter the same mistakes. It’s like revisiting a photo album and watching yourself grow up as a writer as the novel goes along. Here are some things that I’ve done to reduce waste. I realize the more I strip down each sentence, the better the flow of the story is. Destroy all prepositional phrases. Most of the time I realize these are unnecessary and each sentence is clearer when they are removed. Delete long meandering paragraphs of description. I had a lot of these and they were darlings but I had to kill them. When I examine them in compared with my target audience (children 14-18), they must go. Young adult fiction has no time to wander about as it must contend with video games, online videos and the like. Look for duplicate words in the same paragraph and either cut them out or add something new. Be wary of adverbs. Excitedly, jovially, whatever-ly. I try to remove them all. However there are times when I feel they belong. Look for descriptive but non-descriptive words – large, small, box, red, dirty, bad smell and replace them with another more colorful one – gargantuan, miniscule, trunk, crimson, soiled, and pungent. Sometimes you’ll find one of these words takes the place of three. These are just a few problems that I look for when editing and is just the tip of the iceberg. The main objective is to make each sentence as lean as possible. If you are editing and have tips of your own, please share them in the comment section below. Otherwise, happy writing and editing. Hello readers. It’s been a while since I focused on my blog. I have a thousand legitimate excuses and today I’d like you to introduce one of them: Jot – the Grand Rapids Mini-Writers Conference. If you’ve been a regular reader on my blog you probably have heard of it. It was a one night writers conference put on by my writers group. It was held last Friday the 8th at local indie bookstore Baker. It could not have gone better. First, the turnout was double what we anticipated. We had over sixty people attend. We ran out of chairs and hand outs, it was beautiful. People gave it favorable reviews and we are already dreaming about the next conference. Such an energizing time could not have been possible without the people so if you attended, thank you so much for making it a great event. My speaking portion was chronicling my life as a novelist thus far. I covered starting your novel, drafting, and submitting. If you are interested in watching a nervous man sputter out his thoughts, I have posted it below (Bob cringes). The other presenters/interviews can be found by clicking HERE.